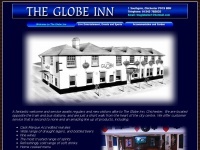 The Globe Inn, in the City of Chichester, has a popular sports bar with garden area and provides B&B accommodation. 6. Produ­ce Faster Estima­tes With PDF Ta­keoff Softwa­re /produ­ce-faster-estima­tes-with-pdf-ta­keoff-softwar..
8. Get In Sha­pe This Year With Per­so­nal Trai­ning Lon­don /get-in-shape-this-year-with-per­so­nal-trai­ning-lon..
9. Get­ting Remo­vals In Not­tingham Done Isnt Ter­ribly Diffi­cult /get­ting-remo­vals-in-not­tingham-done-isnt-ter­ribly.. The web server used by Chichesterglobeinn.co.uk is located near the city of Oak Ridge, USA and is run by Wiscope Member. This web server runs a few other websites, mostly in the english language. The websites of Chichesterglobeinn.co.uk are hosted by a Apache server and were developed in the programming language PHP. The content management system WordPress in the version 4.4.5 is used. The markup language of the website is XHTML 1.0 Transitional. The website does not specify details about the inclusion of its content in search engines. For this reason the content will be included by search engines.